Hello Guys!! Make your career through UPSSSC Latest Recruitment 2016 and if you are searching UP Govt Jobs, then you people reached right page. 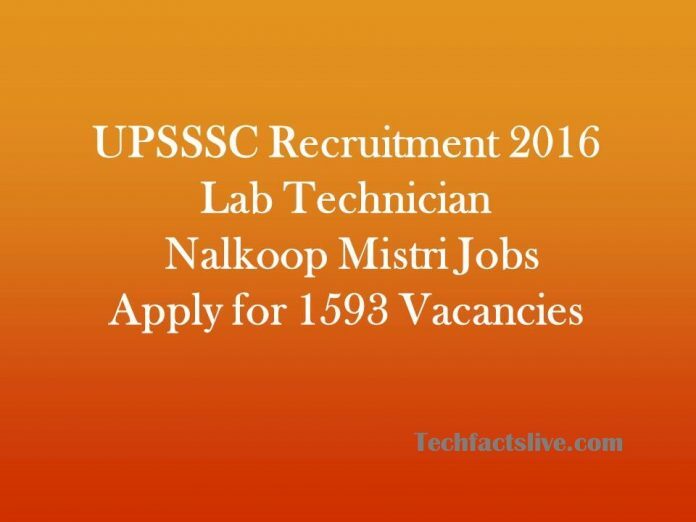 Through the Latest Notification, the authorities are going to recruit 1593 vacancies of Nalkoop Mistri and temporary Posts of Laboratory Technician. Fascinated candidates go for UPSSSC Recruitment Apply Online via upsssc.gov.in. Candidates can also download official Advertisement No.24-Exam/2016 and Advt No.26-Exam/2016 through below links. The well name of UPSSSC is Uttar Pradesh Subordinate Service Selection Commission. Uttar Pradesh SSSC was established in the month of November 1988 at Lucknow. The main of Commission is for conducting recruitment exams to select right candidates from various services in the UP State. UP Government is going to recruit 672 Nalkoop Mistree Vacancies and 921 Laboratory Technician Vacancies in Director General, Medical & Health Services and Director General, Health Education & Training shortly in 2016. Candidates can check out details of Uttar Pradesh Lab Technician Vacancies at below. Official Notification for above posts is going to release soon at upsssc.gov.in. The minimum qualification required for Nalkoop Mistri Posts is 10th/Matriculation passed with ITI 5 years of relevant experience from recognized board. Intermediate/ Plus two/12th Class with Science & Technician Diploma awarded by Uttar Pradesh State Medical Faculty or Equivalent from any other UP State Medical Faculty is eligible to apply for Uttar Pradesh Lab Technician Vacancies. The age limit of the candidates is also the one of primary criterion considered by the UP Government in the selection process for the UPSSSC Nalkoop Mistri Jobs Notification 2016. The candidates must be in between the age group of 18 to 40 years old as on 01st July 2016. Eligible candidates will be selected on the basis of their performance in written examination followed by Interview. After selection, shortlisted applicants will earn good amount of pay scale i.e. Rs.5200 to Rs.20200 with Grade Pay. All Interested candidates need to logon to the official portal of UPSSSC i.e. upsssc.gov.in. Find UPSSSC Latest Recruitment 2016 and hit on that link. Now go to Apply Online Section and start to fill your online form. Complete your registration and pay the application fee as per norms. Submit it and take a print out of confirmation page for future reference. For Nalkoop Mistri Vacancies: Application fee of Rs. 225/ for General & OBC Candidates, Rs. 105/- for SC/ ST category, Rs. 25/- for PWD. For Lab Technician Vacancies: General/ OBC candidates have to pay Rs. 185/- as application fee while SC/ ST category candidates of Uttar Pradesh will have to pay Rs. 95/- as application fee and Rs. 25/- for PWD Candidates. Application fee should be paid through Net Banking/ Debit Card/ Credit Card/ Challan through State Bank of India (SBI). The UPSSSC Recruitment Apply Online Registration available from 15th of September 2016 to 5th of October 2016 for Lab Technician Posts and 22nd of September 2016 to 17th of October 2016 for Tubewell Mechanic Posts. Uttar Pradesh Subordinate Services Selection Commission shall organize a Combined Laboratory Technician (General Recruitment) Competitive Examination 2016 to the Posts of Laboratory Technician in different Departments.